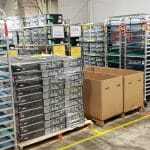 Resale Resource provides certified computer recycling services in Austin, TX with 20 years experience to take care of or your high-tech equipment and responsibly recycle, refurbish, and re-use those IT assets. Protecting your personal information is important, but recycling your computer is also good for the environment. Computers contain all sorts of precious metals. Gold, silver, platinum and others that can be harvested from the components of the computer and reused. Helping computer makers reuse these metals instead of having pay people to mine them both protects the environment it also lowers costs and prices on electronics. When you have a computer you’re getting rid of being smart about it and paying a few dollars to have it destroyed by professionals who can assure you nobody will ever get anything from the computer can be an investment that will save you a lot of money in the long run. The savings you get can be more than just your money, your reputation and your career could be at risk if the wrong people were to get their hands on your personal information. Handling your computer recycling the smart way will give you peace of mind and let you rest knowing your personal information is safe.